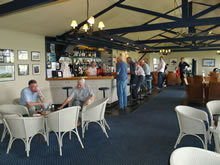 West London Aero Club has an active social calendar and offers a fully licensed bar and restaurant. The bar is furbished in keeping with the history of the Club and the walls are decorated with historic photographs. The bar and catering facility offers a warm welcome to all members and their visitors. Breakfast is served from 8am until noon and is worth flying in for. In good weather we can offer the delight of eating alfresco on the lawn in the front of the clubhouse, stay long enough and you will experience one of the most beautiful sunsets in the country. The bar and restaurant provide a full menu offering a wide choice of fresh fish, meat and pasta dishes. All dishes are freshly prepared and cooked on site by our own in-house chef. We offer an attractive choice of vegetarian meals, along with a very reasonable child’s menu. A choice of three different roast lunches are served on a Sunday with a variety of scrumptious home-made desserts, which change according to the season, but always retaining the old favourites, like apple crumble and creme brulee. Reservations can be made on 01628 823799, it is advisable to book for parties of four or more. A service charge of 10% is payable on parties of eight or more persons. We will continue to offer a selection of toasted sandwiches during the hours the kitchen is closed. Cakes and confectionary are also available.